Birthday months are always fun. However between planning a wedding, working full time and studying for my CIM Certificate, there hasn’t been a whole lot of celebrating. On top of that, the fiancée ran off for a weekend away for his cousins stag & the best bud ended up in Amsterdam! Boohoo to me. Anyhoo, to make up for being away, the Fiancée did what he does best and booked me for date night. Meeting at 5.30 soon became 7.00 and our leisurely stroll around Selfridge was briskly cancelled in favour of heading over to the restaurant. Being a Friday & a veggie day for me, he made the sensible choice not to take me to somewhere yummy, healthy and most likely Asian. Instead following a heap of research and a new-found love for Truffle, we meandered through the mews of Mayfair and ended up at the Mayfair Pizza Company – names Rocket in a previous life. Although I’ve booked many a lunch at Rocket for colleagues, I myself have never eaten there. As we arrived at the door, we made our way up the spiral staircase to a beautifully atmospheric room with high ceilings, possibly wooden floors (I want them to be wooden but truth be told, I have no idea if they were), a heap of wine along one wall and a moving ladder. To say the I wasn’t in love would be a complete and utter lie. We were quickly seated at the table with the best view in the house (yes he’d requested it) and were approached to take our drinks order. Having ordered our glasses of Champagne, we started delving into the menu. Whilst the Fiancée thought this would be super easy (one of everything with truffle in it, on it or around it), it turned out to be slightly more difficult as I’m practically vegan on a Friday. Anyway we made do and selected everything we could think of! 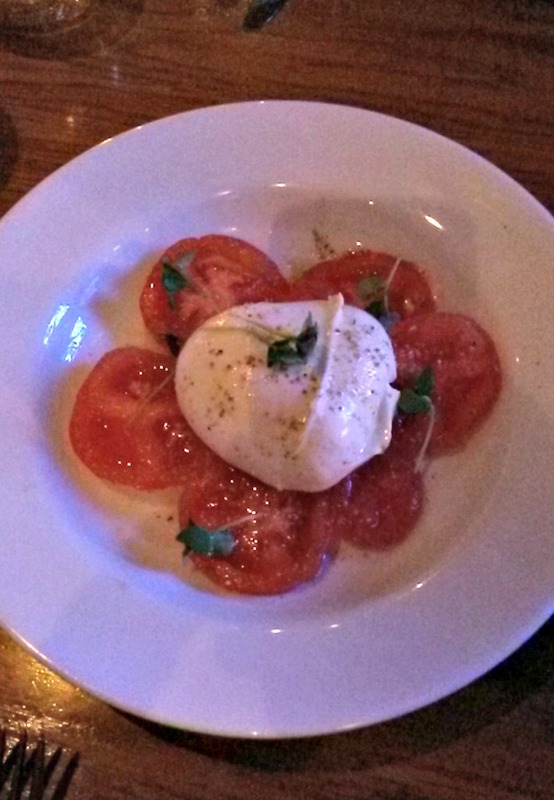 We started off with the Buffalo Mozzarella which was perfectly soft & creamy. 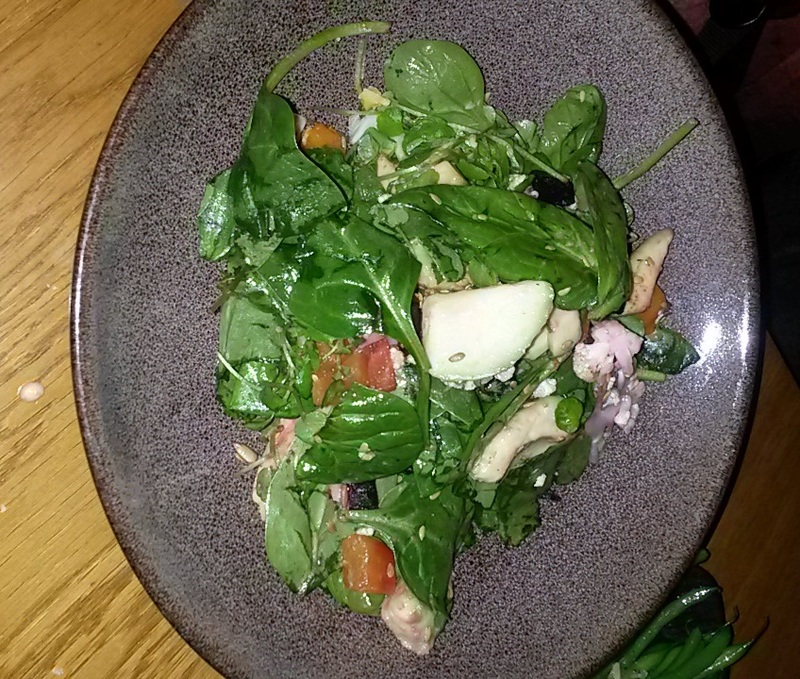 To keep things on the healthy side, we decided on a Rare Tuna Superfood Salad to go with this. Obviously we asked for the Tuna on the side which managed to satisfy the Mr’s craving for non veg food whilst keeping the salad veg. To me this felt a little bit like rabbit food, but the Mr seemed to like it and given that it gave us a dose of superfood, I really shouldn’t be complaining. 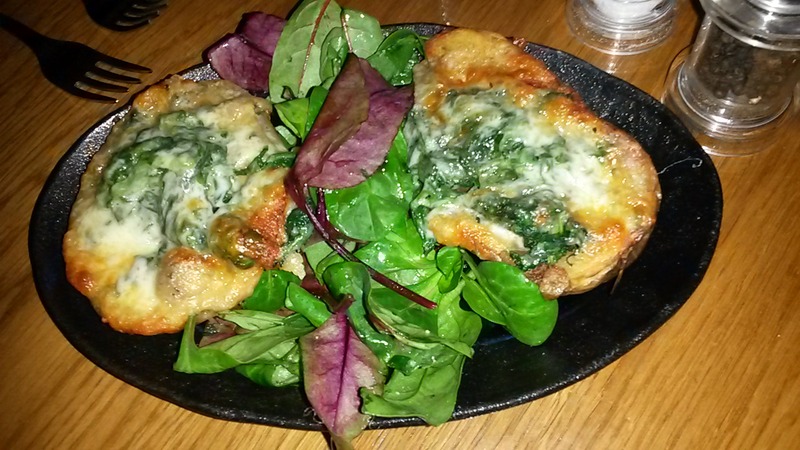 As if we really needed any more starters, we got a bit excited and ordered the Loaded Potato Skins with wild mushroom & spinach. These were good, quite Moorish and very filling, we didn’t quite make it through both pieces, however had there been some truffle thrown into the mushroom & spinach party, I’m sure these would have gone within minutes. Onwards & upwards, we finished starters and along came out mains. 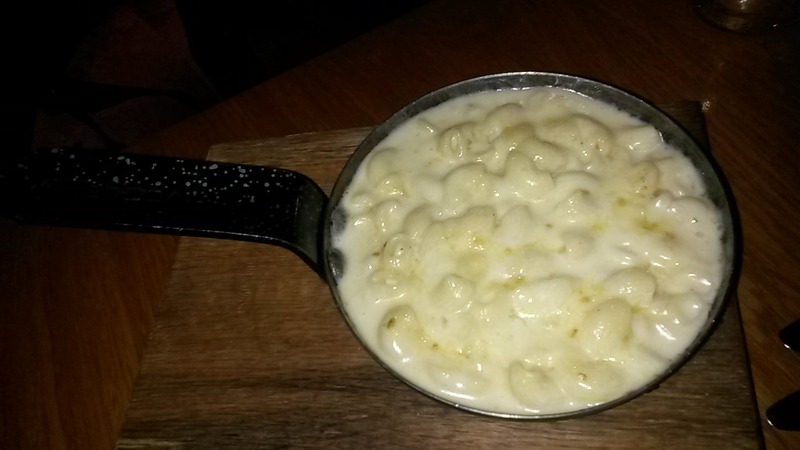 Because were piggy’s we ordered the starter size Mac ‘n’ Cheese. This was cheesy and yummy but in the normal fashion, it was super heavy. 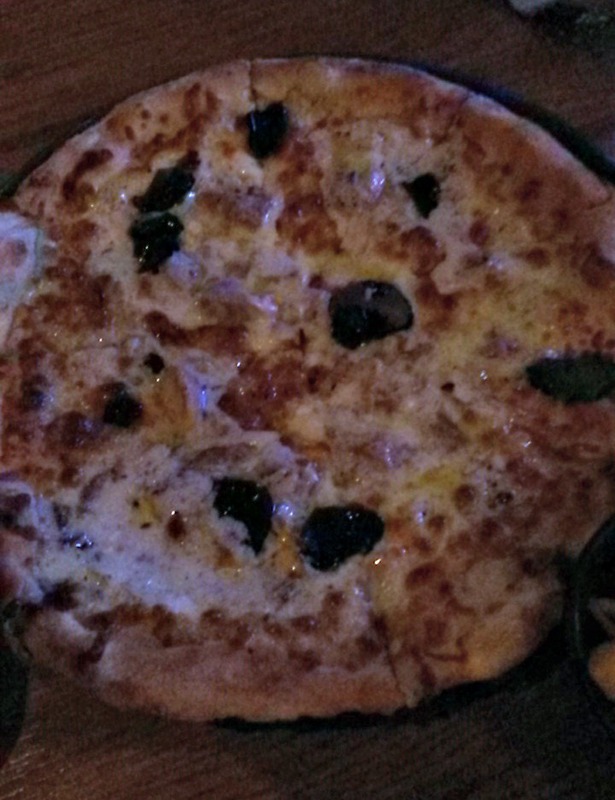 With regard to Pizza we had to do the right thing and order the Mayfair Pizza Co Truffle & Porcini Mushroom Pizza. I have to say, this did not disappoint. Whilst it doesn’t look that different to a humble Domino’s pizza in the picture, it tasted amazing. The truffle flavour was just intense enough and worked amazingly with the cheese. I’m literally salivating whilst writing this. 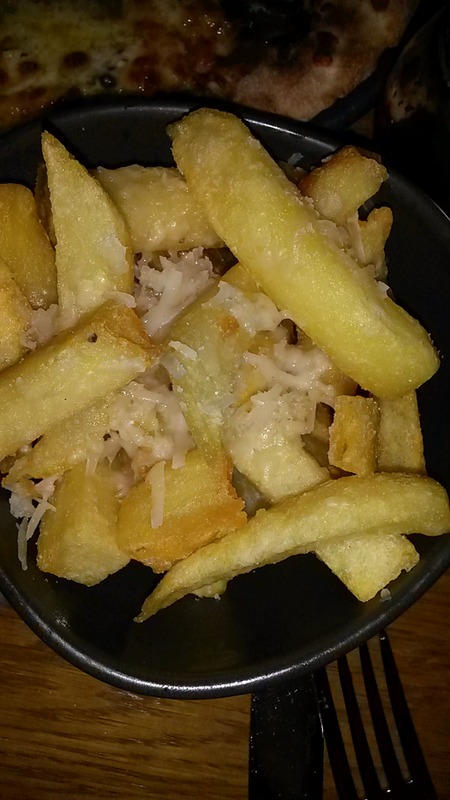 As I’ve already said, were piggy’s, so there was no way we were visiting this truffle haven without ordering the most unhealthy thing on the menu – the Black Truffle & Parmesan Chips. Oh. My. God. Were. These. Good. – enough said! By the time we made our way through the massive amount of food on the table, we suddenly realised we may well have ordered too much food! The fiancée bought be here because he’d read amazing reviews about the dessert pizza. But it was at this point we realised we may not even make it to dessert! In order to stop ourselves from eating more, I had to put an empty bowl over the chips and then declare that the Fiancée wouldn’t want to eat them now as the bottom of the bowl is likely to be dirty. Thankfully this thought also stopped me from devouring any further. 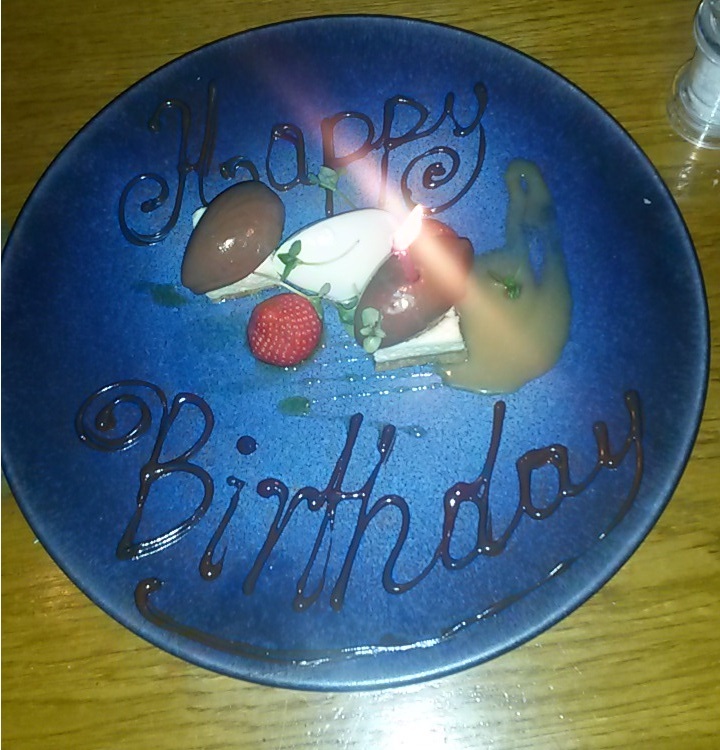 I tried my best not to eat it, I stared for a bit, blew out the candle and then stared some more. However there reaches a point when the dessert starts talking to you and its at this point you know you just have to eat it…and so I made some room in my stomach and gobbled up the whole plate! Wedding diet?! What wedding diet!